"Baby You Can't Drive My Car"
CarGo is a self-driving car company. 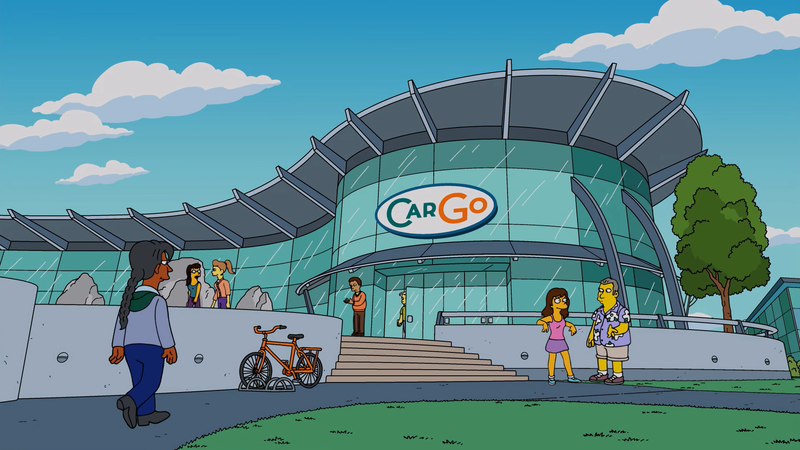 CarGo moved to Springfield, beating out fifty other cities. The company offered new jobs, one of which Homer applied for. Homer applied as a tester for the self-driving cars. He went to the interview, which was run by Antoine and Zoira. They liked him due to his passiveness and poor driving record and gave him the job after he sat around doing nothing for several hours. Homer quickly grew to like his new job, liking that he got paid for sitting around doing nothing all day. He then grew to like it even more when he found out that the cafeteria offered free food. He showed Marge around the campus and together they inspired the programmers to have fun, which increased their creativity. Upon seeing this, Antoine and Zoira promoted Homer and hired Marge as his partner, to keep their employees relaxed. Homer and Marge then got the employees together doing fun activities. Upon seeing how this new company was, many employees of the Springfield Nuclear Power Plant quit. When they realized the reasons for the employees quitting, Mr. Burns and Smithers went undercover at CarGo and applied for jobs. Upon exploring the campus, they realized that the employee benefits and pleasant workplace was the problem they had with the Power Plant. Meanwhile, Homer and Marge realized that the cars were listening to them and taking them to places they talked about. They then went to Antoine and Zoira to confront them about this, where they revealed to them that sponsors paid them to get the cars to take them to places. Homer, Mr. Burns and Smithers then broke into the server room to shut down the cars. Marge discovered them and tried to get them to stop because she enjoyed working at the company. When she realized they wouldn't stop, she went to Antoine and Zoira to tell them about it. They were in a meeting discussing their next step, microphones in the key fobs, so they could listen to their customers all the time. Marge was surprised at this and went to help shut down the cars. After this, the company then started making talking tattoos to win customers over. Episode – "Baby You Can't Drive My Car"
Modified on November 5, 2018, at 11:44.